In 1967, Roman Polanski directed the film entitled "The Fearless Vampire Killers - Pardon Me, Your Teeth Are In My Neck," in which he himself played the role of Alfred, the clumsy assistant of Professor Abronsius. Polanski's previous partner and producer, Andrew Braunsberg, came up with the idea of turning the story of "Dance Of The Vampires," as the film is known in German-speaking countries, into a musical. The two met in Vienna with Rudi Klausnitzer, Director of the Association of Viennese Theaters, and decided upon Jim Steinman as the ideal composer, and experienced lyricist Michael Kunze. The production premiered on October 4, 1997 in Vienna's Raimund Theater, where it was staged 677 times and seen by more than 800,000 theatergoers by 1999. Germany's Stella AG, recently acquired by concert and show producer Deutsche Entertainment AG, was looking for something to replace the outgoing musical, "Miss Saigon," in Stuttgart. After a series of negotiations at the executive level, a decision was quickly made in favor of Polanski's musical. 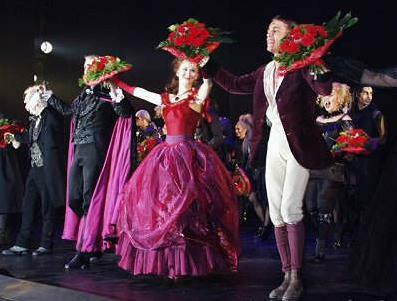 The production celebrated its German premier on March 31st at the Musical Hall in Stuttgart's impressive International Center, where "Beauty And The Beast" is also being staged after closing its run in Vienna. The curtain rises and the dance begins. Professor Abronsius (Werner Bauer) and his assistant Alfred (Aris Sas) are searching for vampires in Transylvania. During a snowstorm, they take refuge in an inn where and astonishing amount of garlic happens to be hanging around. But neither the innkeeper Chagal (James Spano) nor any of the inn's guests are interested in discussing vampires, let alone a mysterious castle. Alfred immediately falls in love with the innkeeper's pretty daughter Sarah (Barbara Kohler). However, chief vampire Count von Krolock (Kevin Tarte) has already pointed two sharp teeth in Sarah's direction, as he is in search of the great love of this life, just as his homosexually inclined son Herbert (Thomas Mulner) takes a liking to Alfred. The purpose of the first act is to introduce the characters to the audience and to set up the plot, while the scenery switches back and forth between the interior and the front of the inn. The quirky professor, with his rolling R's and his oddball logic, is particularly adept at generating laughs. The scenery of the second act are masterpieces of stage-building, artistic compositions one cannot help but enjoy. As if moved by the hand of spirit, a ballroom with columns and a showpiece 23-foot spiral staircase rise from the stage floor, an entire cemetery emerges from the background, while Abronsius and Alfred run through the seemingly endless corridors of the vampire castle. All the while, bloodthirsty vampires run through the theater and frighten the audience. The music of Jim Steinman fits this horror spectacle perfectly as it alternates between earthy rock and soft melodies, even if he did draw on the Bonnie Tyler hit "Total Eclipse Of The Heart" for inspiration, so that some of the songs sound somewhat familiar. 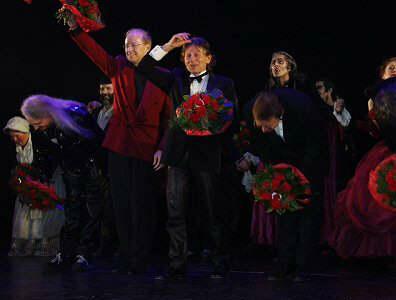 As far as choreography is concerned, the final number was so impressive that none of the members of the audience could keep their seats. And as far as the singing and acting is concerned, the actors (after all, Polanski has plenty of experience directing actors), most of whom were already part of the Vienna production, are at the top of their game. With his deep voice and sanguine charm Kevin Tarte, who has taken over the role of Count von Krolock (played in Vienna by Steve Barton), is truly the star of the production. Although "Dance Of The Vampires" is not a terrifying show, it will certainly not leave any of its viewers unaffected. Everything in this production works - the music, the cast, the scenery, the lighting, and the costumes. And no one should miss this little dance of Stuttgart's vampires.